There’s an old saying: “You’re either in your bed or in your shoes, so it pays to invest in both.” Most gamers would probably add an ergonomic chair to that list. In the modern world where so many people sit for hours gaming on a computer, spending $200 or so on a quality gaming chair that will keep you comfortable and without aches for long hours makes all the sense in the world. 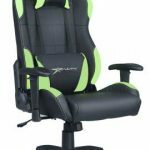 At the $200 level, you can expect great gaming chairs that come with some unique features that can really minimize common ailments associated with gaming for too long. This includes back pain, nick stiffness, and carpal tunnel syndrome. 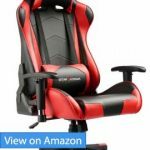 Dedicated lumbar and neck pillows, bucket seats, height adjustable armrests and even some chairs with dedicated footrests can be found in gaming chairs at this price level. In this guide we handpick the very best budget gaming chairs under $200 so you can finally game in comfort and in better health, all the while without leaving a hole in your wallet. The GTRACING Gaming Chair is a boldly styled chair with ergonomic comfort and an impressive recline. 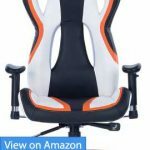 Whether you work on your computer or use it mainly for gaming, this chair can keep you comfortable and in good posture for hours. While it may be a bit too flashy for an office setting, this GTRACING chair is perfect for your desk at home. One of the first things to look for in an ergonomic gaming chair is how it will treat your back. In addition to the winged curve of most racing-style chairs, the GTRACING Gaming Chair has adjustable pillows for neck support and lumbar support, which means you can sit back comfortably without worrying about future back pain or bad posture. One user said that this gaming chair was more comfortable than any office chair he had used before. In addition to feeling great, this chair looks awesome as well. A striking two-color palette draws the eye, and even the wheels have a sharp look. Many people like to match the look of their chair with their computer, so if you have a boldly-colored battlestation, this could be the gaming chair for you. Several users of this chair mention the coloring on this chair as a big plus. Finally, the GTRACING Gaming Chair has an above-average level of adjustability, especially among other gaming chairs in the $200 range. One disabled owner of this chair commented that this chair’s adjustment options perfectly met their needs. The back reclines up to 170°, so you can practically lie down in this chair if you want (perhaps detach the lumbar pillow first, though). 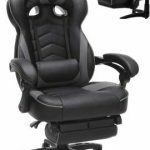 The high recline of the backrest makes this gaming chair a solid option for any sort of work or relaxation that involves sitting. All in all, the GTRACING Gaming Chair is one of the most well rounded gaming chairs in the $200 range, with adjustability both for comfort and utility. If you’re looking for a chair that has these features and a keen look to boot, this is a solid best. The RESPAWN-110 Gaming Chair comes at a slightly higher price than the GTRACING Gaming Chair, but it also offers the next level of comfort and a documented commitment to lifelong customer support at a budget price tag. Instead of the minimal plastic armrests featured by most gaming chairs, the RESPAWN-110 chair has longer, fully padded armrests that give the chair a more substantial look and feel in addition to keeping your elbows comfortable. Users report being impressed with the way the armrests shift back as the chair reclines so that they are conveniently usable no matter what position you use the chair in. With your arms getting all this rest, your legs may begin to feel left out; to remedy that, RESPAWN’s Gaming Chair has an extendable footrest so that you can be fully relaxed. 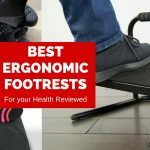 Users say that it slides out easily, and while it can’t support a lot of weight, it can hold up your feet just fine. Whether you’re a PC or console gamer, this chair lets you really kick back to replenish your energy before heading back out into the battlefield. One of the biggest worries when buying inexpensive gaming chairs is that they will begin to break down after a few years of use. With the RESPAWN-110 Gaming Chair, you can rest easy on that front because each chair comes with a Limited Lifetime Warranty. Many reviewers confirm that they received replacement chairs or parts from RESPAWN when issues appeared in their original orders. Finally, it should be noted that different people have different preferences as far as firmness of cushioning is concerned. Several users reported that the padding of this gaming chair was stiffer than they would like, so if you want a chair that is extra soft and plushy, you might want to look at a few other options. Overall, the RESPAWN-110 Gaming Chair is on the high end of this list with great cushioning and a warranty-supported lifespan, but be aware of where the seat falls on the firmness spectrum. The Killbee Gaming Chair has a futuristic look and is specially designed for larger users with features such as an extra-wide seat and a ventilated back. If you find that most gaming seats you try are too small, it’s definitely worth giving this one a look. This chair has a weight capacity of 330 pounds and the seat is 21.6 inches wide with gentle wings to hold you in place as your body shifts from left to right while fighting your way out of a war zone. The seat’s padding is high-density foam to resist undue compression. Despite the official weight capacity, even users over 350 and 400 pounds report using this chair comfortably and without issue. In addition to being wide, the Killbee Gaming Chair is also tall: the back alone is 31.8 inches tall, and the chair as a whole measures up to 50.3 inches high–that’s as tall as some people are! Many users of this chair are over 6 feet tall and report being happy to finally find a chair that fits them. Most gaming chairs have polyurethane upholstery instead of mesh for its greater comfort factor, but a downside of this, especially for larger users, is the way it traps heat and promotes sweating. The Killbee Gaming Chair aims to get the best of both worlds with a vented back that lets air through without sacrificing the cushioning of polyurethane-covered padding. One downside of this chair is that, while it has a similar ergonomic design to other chairs in its class, it lacks dedicated lumbar and neck pillows. It’s always possible, of course, to supply your own pillows, but since most of the other chairs under $200 on this list do come with adjustable pillows, it’s worth factoring this into your decision. To sum up, the Killbee Large Gaming Chair is a great option for anyone who is taller or heavier than average; its large frame and special venting are designed to keep large people comfortable in a way many smaller chairs cannot. 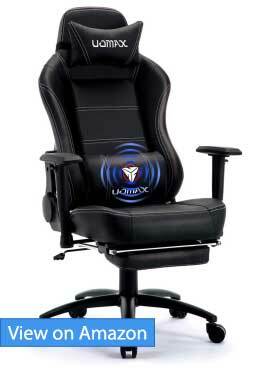 UOMAX is a heavy duty ergonomic gaming chair ideal for people with a larger body type. A tall 32″ back plus wide 21″ wingless seat ensures you don’t feel cramped while gaming. The seat on standard gaming chairs are usually “winged” to hug the people as you sway left to right, though this takes up precious space, something larger users may not appreciate. Strong stitching and detailed polyurethane leather upholstery covers a padding of molded cold foam for optimal breathability and temperature control. 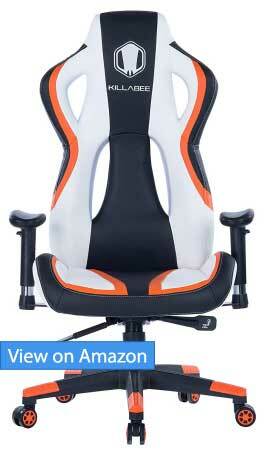 The seat is made of 4.8″ thick high density foam, which bests most gaming chairs in this review. Another sound design choice to accommodate even heavy users. One common thread of non-ergonomic chairs is a straight, unmovable back, the sort that can cause discomfort if you sit for too long. In contrast, the UOMAX Gaming Chair has a rocking function that allows the chair to move with you for better comfort. 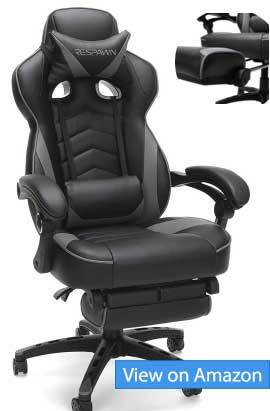 The chair also reclines literally all the way back 180 degrees when you’re looking to make a pit stop from gaming. Combined with a pull out footrest, and you’ve got yourself the ultimate napping experience. Other ergonomic features found on the UOMAX chair are twin pillows for the head and lower back. The later has a built in vibration feature powered using USB. Like most cheap massage pillows, it’s nothing to write home about, though nonetheless a nice touch for a budget gaming chair that costs under $200. If you’re tired of the aggressive, racing design that adorns most gaming chairs, the Essentials Gaming Chair is a breath of fresh air. Its non discrete, compact design makes for a comfortable gaming chair that will easily blend in with your room or office even when you’re not gaming. Most owners of the Essentials Chair were thoroughly impressed with the quality and comfort of the chair, especially considering the well below $200 price. The seat is upholstered in SofThread Leather, which is a premium, softer version of the standard PU leather covering. It’s cool to the touch, with a sense of refinement often lacking with bonded leather chairs. It should be said that this chair doesn’t have as many extra feature as some of the others on this list. For example, the backrest only tilts as you apply force to it, though doesn’t recline. The armrests are not height adjustable either, though they do flip up for easy storage. If all you need is a comfortable place to sit while you work or play on your computer, this chair is more than good enough. 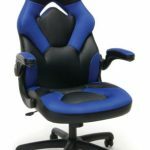 The Essentials Mid-Back Computer Gaming Chair is a very affordable ergonomic gaming chair and has good warranties to support it. If you are looking for something simple but comfortable, Essentials has you covered. 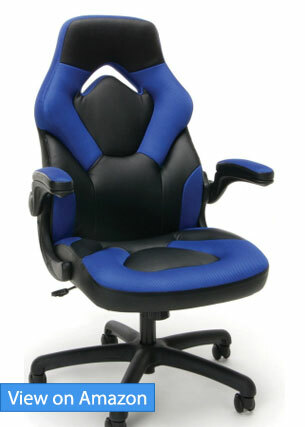 The E-WIN Gaming Chair is a standard racing-style gaming chair made with high-quality materials. 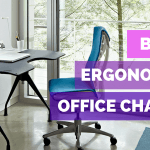 A lot of research has gone into its ergonomic chair design, and this chair takes advantage of that knowledge with a back designed to cradle the human spine and a seat that can keep you comfortable for hours. The seat of the E-WIN Gaming Chair is padded with a high-tech cold cure forming sponge that gives the cushion great elasticity and keeps it at a constant temperature for maximum comfort. One user wrote that this chair was even more comfortable than the high-end DXRacer chair they had. 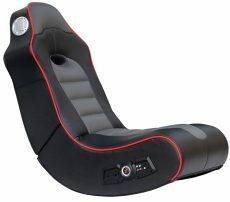 The back of this chair has the characteristic curve of a racing-style chair, and is specially designed to support the shoulders and neck, as well as the lower back. Users report a great relief in back discomfort once they started using this chair. Finally, the E-WIN Gaming Chair has high-quality adjustable lumbar and neck pillows to complete the comfort of using this chair. The lumbar pillow is slightly larger and flatter than most in order to support your lower back without feeling like it’s protruding too much. A few reviews by larger users mention that this chair feels a bit small to them; the weight capacity is 330 pounds, but someone who is taller than 5’10” or 5’11” might want to look for a larger chair. 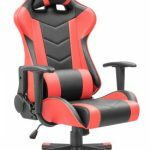 Overall, the E-WIN Gaming Chair probably tops this list for quality of materials, and also price. It’s falls just above $200 however, which is still a steal in my opinion. The workmanship of this chair makes it stand out, and in this case you get what you pay for. The Cyrola Gaming Chair is a great chair for large people who need the next level of ergonomic support. If you’ve just read the previous review of the E-WIN Gaming Chair and are disappointed because you need a larger chair, take a look at this one. The Cyrola Gaming Chair is even taller than the Killbee Large Gaming Chair discussed earlier: at its peak it has a height of 53.5 inches. The weight capacity is 350 pounds, and users over 300 pounds report finding this chair very sturdy and comfortable even after hours of sitting. The seat cushion is extra thick and padded with high-density sponge to keep users from sinking in too much over time. Many users mention the nice cushion in their reviews. 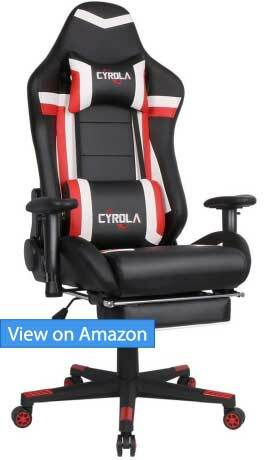 Even with its large size, the Cyrola Gaming Chair still has the ability to recline all the way back to 180° if you want to lie down. Along with the built in footrest, user commented that he enjoys napping in this chair, and it can only be assumed that many others have dozed off while sitting cradled in its comfortable recline. 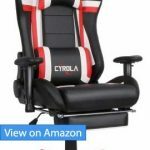 The Cyrola Large Gaming Chair, unlike the Killbee model mentioned earlier, has adjustable lumbar and neck pillows and as such is a strong option for any large individual looking for an budget gaming chair. We finish our list with the Ficmax Ergonomic Gaming Chair, a sleek model with all the features you expect at this tier and a few more. From the adjustable neck pillow to the telescopic footrest, this chair is designed to keep you supported and comfortable. The lumbar support pillow on the Ficmax Gaming Chair is special; in addition to serving as a regular pillow, it has a vibrating massage function with two settings. 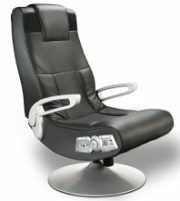 Users report that the massage action was fun to use and a real plus when it came to evaluating this chair. The seat cushion of this chair is padded with high-density foam and is a hefty 4.8 inches thick. Users have referred to this cushion as a very comfy feature, with 4.8 inches of foam that’s thicker than that found on most budget gaming chairs around $200, and amazing to sink into. Ficmax offers excellent after-sales support on this chair: replacement or money back within 30 days, a 12 month warranty on parts, and a lifetime warranty on the frame. One user said that they found customer support to be very responsive and helpful in solving their problems. Several reviewers have mentioned that this chair has a tendency to be squeaky, but they also say that the squeak can be fixed with a bit of WD-40 between the gas cylinder and the underside of the seat. All in all, the Ficmax Gaming Chair is a great ergonomic gaming chair that is strong in features and backed up by good customer support. If you like the sound of extra features like the massaging lumbar support or the extendable footrest, this is the gaming chair model for you at under $200. Rocker Chairs are closer to the floor than most other conventional-style chairs, and are designed with the gamer’s comfort in mind. Normally, they are equipped with padded backs, a scooped L-shape, and headrests, and chair arms. The more higher-end ones can also be equipped with speakers and subwoofers, padded-vibration for the back and underside, RCA inputs, and wireless receivers. 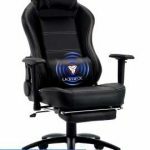 However, while the Rocker Game Chair is a fantastic choice when it comes to temporary comfort and enhancing the gamer’s experience, it is a poor choice ergonomically for long term gaming, however. The rounded L-shape does not promote a straight and neutral spine, which can add extra tension around the cervical (or upper) spine and shoulders. This will add excessive tension to the area, especially after playing for hours. The Rocker Game Chair also does not allow for the feet to be placed flat on the floor, which can result in stiff hips and knees after long periods of time. For the living or gaming room as a chair to host your friends, however, it’s not a bad choice, usually costing less than $150. The next step up from the Rocker Chair is the Pedestal Chair. Like its counterpart, the Pedestal Game Chair is close to the ground and is normally padded to enhance comfort. However, the chair is raised slightly off of the ground and is normally equipped with armrests and a headrest. It also rocks and rotates around a raised pedestal instead of straight from the ground or off of raised wheels. The structure is also more optimal than the Rocker Chair in terms of spinal neutrality. In addition, the armrests allow for a more relaxed upper body, and helps to prevent rounded shoulders and added tension to the neck and upper back. However, the Pedestal Game Chair does not allow for the hips and knees to open and unflex, since the feet cannot be placed flat on the floor. Instead, they are forced into constant flexion and can be left stiff and painful if playing for long hours at a time. Like rocker chairs, pedestal style gaming chairs are best for the living or gaming room to host friends, or for pairing with TVs which are close to the ground. 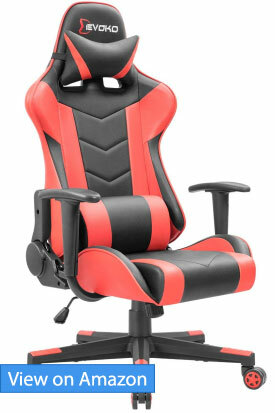 The PC Gaming Chair differs from the Rocker Chairs because it is well-raised off of the floor. This is due largely in part because PCs are normally set up on a desk or table, not on the floor, and so the more optimal positioning would be to sit up higher, with the feet placed firmly on the ground. 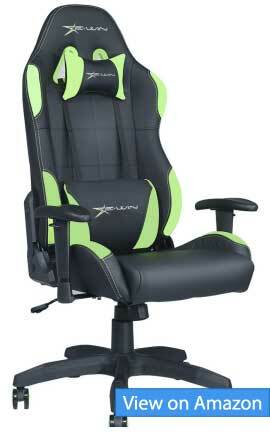 PC Gaming Chairs are also padded and are equipped with headrests and armrests for maximal comfort while playing. They have a similar swivel feature and feel of an office chair, however PC Gaming chairs contain a “bucket style” seat to enhance comfort when sitting for long hours. PC Gaming chairs are the most ergonomic choice of gaming chair. They had detachable cushions, built-in lumbar support, and even have the ability to lean back 180 degrees to take pressure off of the spinal cord when sitting for long periods of time. What’s more, the PC Gaming Chair has the ability to place the feet flat on the floor, which helps to alleviate tension from the hips and knees. Instead of being constantly flexed, these joints have a chance to stretch out and relax during playtime. 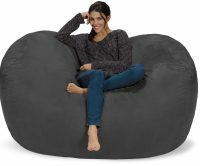 Unsurprisingly, the Bean Bag Gaming Chair is placed directly onto the floor and, like most conventional bean bags, offer little to no back support. In fact, Bean Bag Gaming Chairs offer almost no amenities that other chairs offer, such as: headrests, armrests, RCA inputs, lumbar support, detachable cushions, or speakers. However, Bean Bag Gaming Chairs are padded and offer immense comfort to a gamer. They are also lightweight, flexible, and affordable, which makes them a great choice for young gamers strapped for extra money or space. In terms of ergonomics, however, the Bean Bag Gaming Chair is one of the more poor options because it does not allow for great support, nor the ability to keep the back straight and the feet flat on the floor. If you already suffer from mild to severe back issues, the Bean Bag Gaming Chair is not for you — especially when playing for hours at a time. If you prefer the look, design, and feel of a Bean Bag Gaming Chair but require more support, the Memory Foam Gaming Chair would be your preferred chair. It has the same exact feel as a Bean Bag Gaming Chair but, like classic memory foam products, also offers far more support and comfort than a conventional Bean Bag Gaming Chair. The Memory Foam Gaming Chair is also much larger than most plain Bean Bag Gaming Chairs, which makes it a viable choice for any gamer of any size. What’s more, memory foam contours to the body of the man or woman that is sitting atop it, so it will offer support exactly where you need it the most! Because of this feature, the Memory Foam Gaming Chair can offer exceptional lumbar and upper back and neck support, which will protect your joints and muscles during long playing times. However, much like the Bean Bag Gaming Chairs, the Memory Foam Gaming Chair comes with no additives that can enhance the player’s experience. While it is brilliant to enhance the player, it does not come equipped with extra padding, headrests, armrests, or any electronic add-ons, such as: RCA inputs, speakers or subwoofers, or vibration options. The Memory Foam Gaming Chair is also ill-advised for those who suffer from tight hips, because the feet are far too close to the floor. This will stiffen the hips and make them more irritable, especially after playing for long hours. In terms of both budget and ergonomics, a PC gaming chair usually excels compared to other types of gaming chairs. All of the reviewed gaming chairs above come in at less than $200, and for those on a really tight budget, there are even ergonomic gaming chairs costing less than $100. 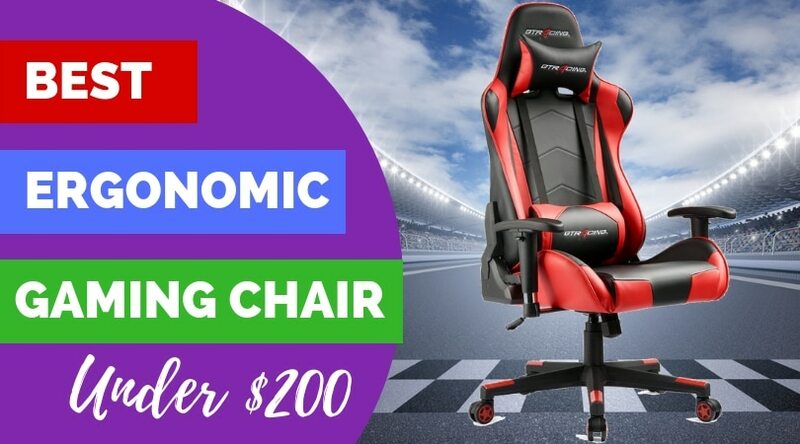 For that money, you are getting a full blown gaming chair with adjustable seat height, 2D or even 3D armrests, a tall back, and neck and lumbar support to support your entire body properly as you game. As you make your buying decision, make sure that the chair you get is the right size for you and has all the features you want; as you can see, there are a lot of options, so you can likely find something that checks all your boxes, not just some. 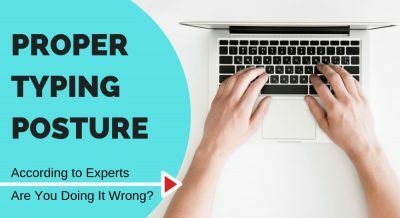 If you’re on a tight budget, don’t be afraid to get chairs that aren’t made by huge brands; there’s no sense in paying a lot more for a brand name if you can get something almost as good or better for a lower price. However, you should be aware of reviews and of the policies for warranties and returns if the chair you choose isn’t what you expect. Most of the gaming chairs included in this guide come with very decent warranties. 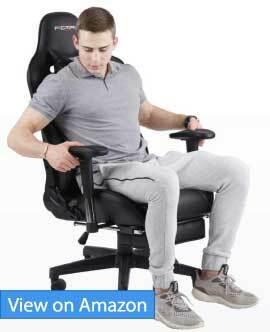 Finally, be sure to value your own health and comfort when you make a decision on buying an ergonomic gaming chair. 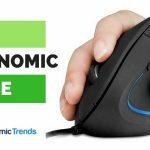 If you spend hours each day sitting at a computer, it might be worth spending more on a chair than you would on a piece of furniture you just use every now and then. 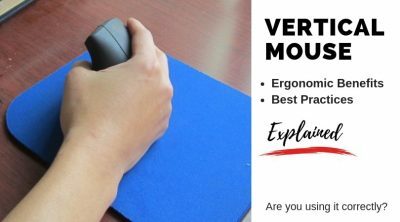 There’s a reason why ergonomic chairs are becoming so popular in this modern age of computers, and an investment now could make your back thank you in the future. Hopefully this guide has been helpful, now get out there and look at some chairs! Absolutely love my GTRacing chair. One of the best chairs I have ever owned. Very comfortable, the material is exceptionally durable, and that 170 degrees tilt is so relaxing. I can’t recommend it enough. Great list, by the way, thanks. You’ve highlighted some good points here. I always tell gamers to invest in the right chair from day one. Using a standard chair can be extremely bad for the back. I’ve used the Cyrola in all black colour for the last six months. It’s closer to $200, but I got it for the footrest. Plus, it’s a large chair, so I appreciate the extra space. It’s not the strongest, but stable enough. I plan on buying another chair and like your review of the Respawn. Thanks for all the details. I have the Circle CH77 right now, and it’s not the best, especially the armrest. Comfortable yes for short term use, but after a while my back started to ache. It was pretty pricey too. Thanks for the list, I’ve narrowed it down to Respawn and the Killbee. Any preferences? Hey, a quick note to thank you for the article. I bought the GTRACING before the holidays, after reading this, and have been using it a lot over the last couple of weeks. My back feels fantastic after my gaming sessions, and that recline is a life saver. My almost new gaming chair was totalled recently while moving houses, and the wife won’t let me spend too much on a new one. This list is really helpful, especially since I tend to play quite a bit. 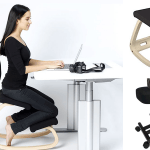 Besides the comfort level, I want something that will keep my posture right and save me from all the aches and pains from sitting for too long. I appreciate that you’ve gone into detail with all the chairs, and I was tilting towards the SLYPNOS initially until I realised that it doesn’t recline past 135. So, I plan on going ahead with the Ficmax. Love the vibrating lumbar and the footrest. Plus, it’s cheaper than the SLYPNOS too I believe. I also like the fact that the company has a lifetime warranty on the frame as that shows confidence in the build quality. Do you know if it is available in colours other than black? I use a big bean bag atm when gaming (mainly console games), though I admit it’s kinda hurting my neck after a while when I’m leaning forward. Thanks for the breakdown of the different types of gaming chairs, it was helpful. I have been using an old Herman Miller Aeron for the last few days, to the point the hydraulics no longer work. In other words, it’s time to move on. I’m really into gaming, so I figured I’d go with a gaming chair this time, one with a tall backrest to support my upper body better. One thing I know from experience is that the recline is very important and I want to go with a chair that has at least 150 degrees recline if not more. I was kind of going for the RESPAWN, but the back only goes down to 130. Although I am not big, I’ll give the UOMAX a try. The extra space is always appreciated, and my kid often sits with me when I’m playing. I just hope I don’t get one of those smelly ones like you mentioned. Thanks for a great breakdown of all the chairs. Brilliant post. I am an avid gamer and can spend up to 4-5 hours at a time playing Fortnite or PUBG on the weekends. So far, I have been using a standard office chair, and my back is a mess by the time I am finished playing. I literally can’t straighten up for a good 5 minute, and desperately need to get one of these chairs before it gets any worse. I can do with some help selecting between the RESPAWN and GTRACING, please. Money is not an issue and nor is the colour and design factor but regarding comfort and support to the back, which of the two is better? RESPAWN has the footrest, but then the GTRACING tilts back 170 degrees, so I’m a little confused. More importantly, which of these two will last me longer considering I’m average build? Thank you. The GTracing and Respawn both feature decent lumbar pillows that move up and down via a strap. That’s always better than a pillow that simply sits on the seat for your back. 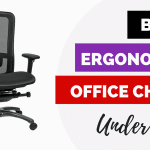 However, if back comfort is your top priority and money isn’t an issue, an office chair with built in lumbar support will always be more comfortable. In that case I recommend checking out the chairs in our Best Ergonomic Office Chairs list instead. Thanks for such a descriptive list. I have been using an X Rocker now for a few months, and it’s pretty cool when hooked up for vibration and sounds. Obviously, its only good for when I’m playing on the TV. I wasn’t sure what to buy for my desk, especially since I play and work a lot on the computer. Since I have a home office, I am particularly liking the RESPAWN-110 with the extendable footrest and how the arms pivot when it reclines. However, the gamer in me is drooling over the colours and style of the GTRACING. Which of the two would you pick for someone who wants it as an office and gaming chair? The Respawn-110 would be my choice if you’re looking for a gaming chair that won’t startle your co-workers at the office. It’s not nearly as flashy as the GTracing gaming chair, with a form factor more in-line with regular ergonomic office chairs. Also look up the newer Respawn-120 on Amazon- its main improvement is the more adjustable armrests over the 110, though overall I still like the 110’s design much more. I am a novice gamer, and just starting to taking it more seriously. This post is beneficial because I had no clue what to look for in a chair. The fact that all of these are below $200 is such a bonus. I’m personally tilting towards the Killbee, being tall and also because I like the style. Do you think the neck pillow is a big deal, I mean I have never used it and not sure how I would adapt to it? The Ficmax with the vibration is pretty cool too, but again not sure if it can be a little distracting in the long run. Thanks once again Jon for such an informative post. This makes it so easy for me to pick the best chair.